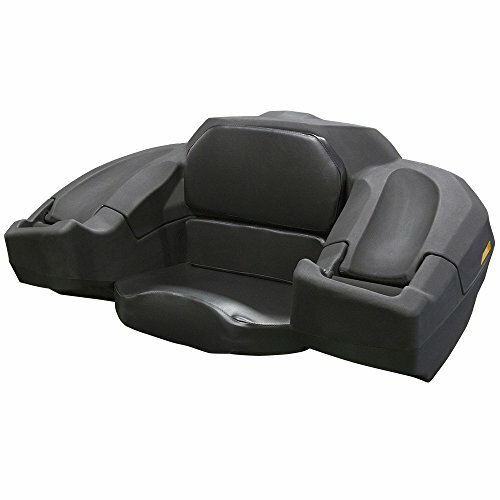 Add more cargo space to an ATV with this ATV rear storage seat. In addition to storing extra gear the rear cargo box has a built-in cushioned seat that can be used during rider rest periods. 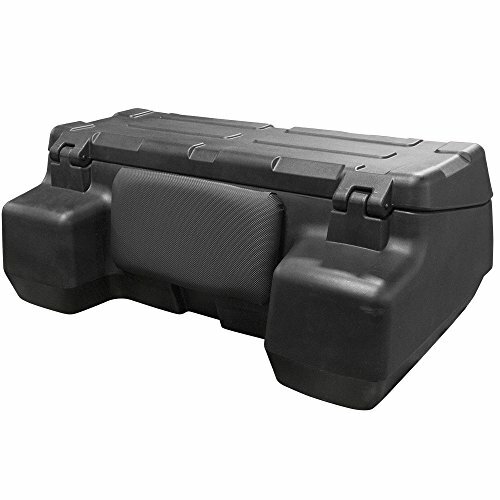 The weather resistant ATV rear lounger storage box is constructed from heavy duty black polyethylene. The rear cargo box includes reflective decals that increase visibility. To keep gear safe & secure the ATV rear storage seat includes two keys to lock the cargo box and built-in elastic straps that can be used to ensure the lid is securely on while riding. The ATV rear lounger also includes U-shaped bolts to mount this cargo box onto the rear rack of an ATV. 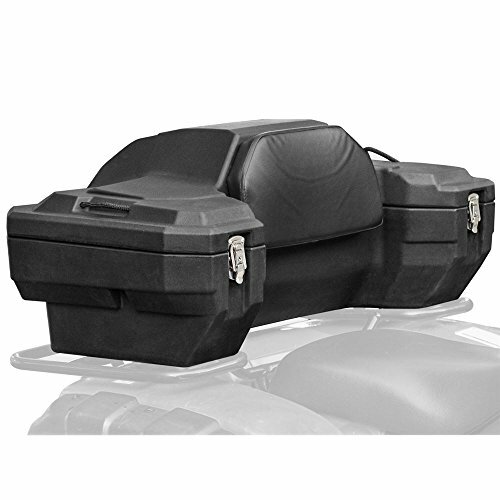 Store more cargo when riding your ATV with the Black Widow lockable storage box. Manufactured from durable polyethylene, this cargo box is designed to be mounted on the rear rack of your ATV. The box can be permanently mounted to the rear rack of your Quad with four included U-shaped bolts. For installation it is required to drill into the floor of the box. This box also features a cushioned backrest, providing a comfortable place to rest when you’re ready to take a break. The quad cargo box is strong and durable and comes with a one year warranty. The box has a tongue and groove style lid system which gives it a good seal against the elements. The cargo box has over 9,800 cubic inches of storage space – enough for you to pack all the gear you need with you for your outings. An easy-to-use locking latch system keeps the lid on the quad box secure and closed, and two red, plastic reflectors on the back of the box provide great visibility for your ATV at night. Rage Power Sport Black Widow Extra wide folding arched dual ramps, 17" wide and have an aluminum construction making them Light-weight and easy to handle. They are the perfect solution for loading heavier all terrain and utility vehicles including lawn mowers, garden tractors, ATV's, golf carts, John Deere Gator's, Mules and other 6 wheel & 4 wheel equipment into your pick-up truck or trailer. These folding dual runner arched ramps are easy to set up, transport and store. The heavy duty hinge system, allows a generous 3000 lb. equally distributed weight capacity. Dual runner folding arched ramps are easy to set up, transport and store. 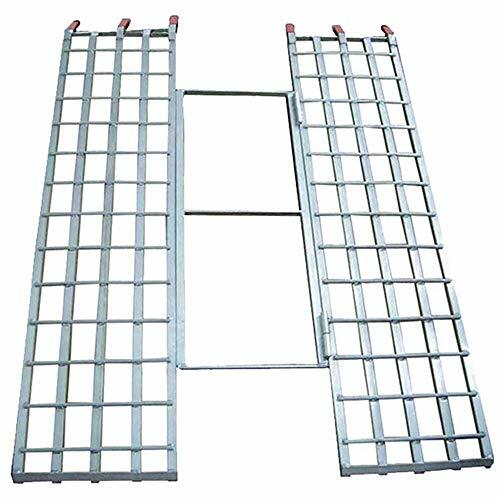 These high quality ATV ramps are full of safety features such as safety straps to keep the ramps in place, a full width plate style attaching lip for the most area of contact on your loading surface, and serrated cross bars for sure traction even in the mud, rain or snow. Sold in Pairs. BW-10817-HD-2. Safely load your ATV for a day on the trails, or a lawn TRACTOR for your next landscape project with this Black Widow aluminium tri-fold ATV ramp. 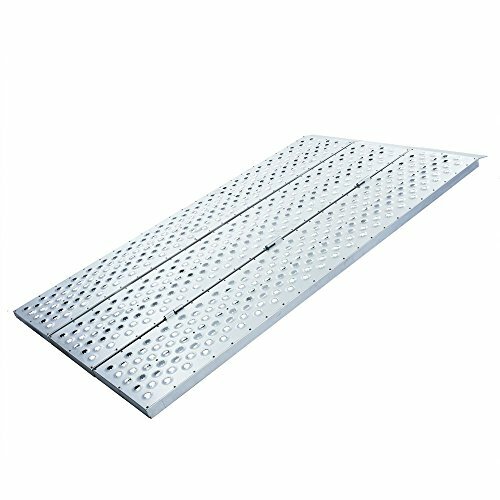 This durable aluminium ramp features a punch plate surface for increased traction in wet conditions, preventing tires from slipping off the ramp and ensuring sure footing as you load your vehicle. This ramp folds down to 93" L x 18-3/4" w x 7" H, small enough to slide under your ATV while in transit, and perfect for storing when not in use. A set of two safety tie-down straps is included to keep the ramp in place. 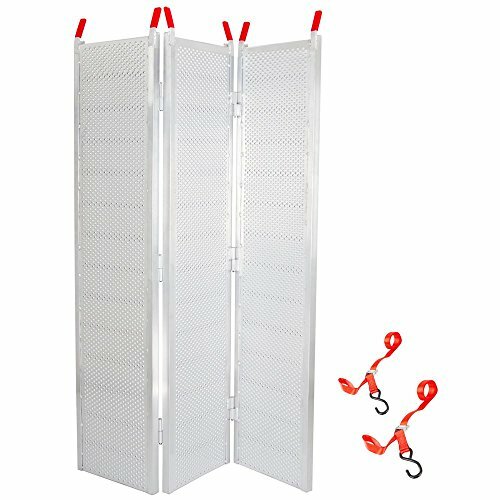 94"L x 54"W Perforated Solid Surface Tri-Fold ATV Ramp. Great for loading ATV, lawn equipment, and small wheeled utility equipment. Maximum 1,500 lb. capacity. Folds to 1/3rd width x 5-5/8" high for storage under or beside an ATV. Rubber coated fingers grip pickup truck tailgates and trailer beds. Heavy duty aluminum construction. Not recommended for use with Golf Carts. These over-sized aluminum Bi-Fold ATV ramps are big enough to handle nearly any style of ATV up to 1,500 lbs. Each ramp features three heavy-duty hinges which allow the ramp to fold in half from 50” down to 25” for convenient storage and transportation. Rubber-coated fingers provide increased support and stability during loading and unloading, and prevent the ramps from scratching your trailer or tailgate. Raised serrated rungs on each ramp offer incredible traction in all weather conditions. The included adjustable safety straps prevent the ramps from kicking out while in use. The Black Widow aluminum Bi-Fold ATV ramp is ideal for loading ATVs, motorcycles, UTVs, Lawnmowers, snow blowers, and other four-wheeled vehicles. It measures 5 feet 10 inches long by 44 inches wide and is designed to be secured to the tailgate of a truck for loading and unloading. It has an impressive 1, 500 pound weight capacity and weighs just 39.5 pounds. The aluminum construction means this ramp will never rust or corrode. 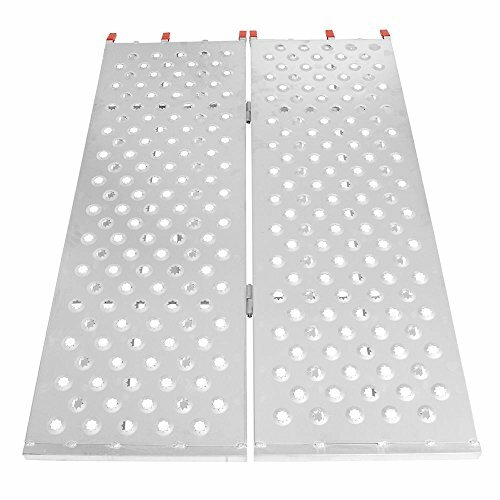 this ramp includes a variety of safety features, including a high-traction punch plate surface that provides extra traction in all weather conditions. Safely load your vehicle in rain, mud, or snow, without worrying about losing traction or slipping wheels. Rubber-coated finger-style attachment points on the end of the ramp won't slip off or scratch your tailgate, and the two included safety straps will ensure that your ramp stays securely in place while in use. Transport trail gear, camping, hunting, and fishing equipment easily on a rear ATV rack in a large, convenient storage box. The hard-sided rear rack box features a comfortable, cushioned backrest area for a passenger to lean on during longer rides. Interior storage space measures 35"L x 12"W x 8.5"H along the longest usable area. 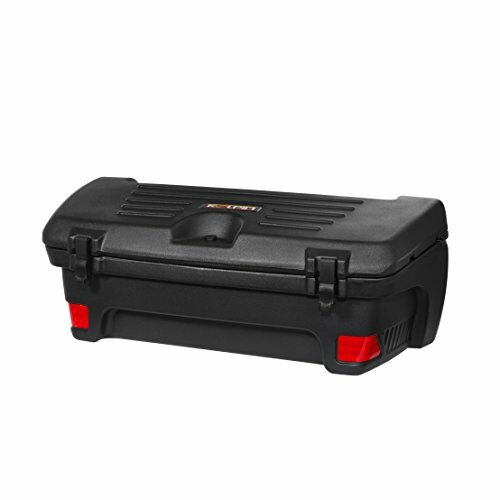 Made with high-density polyethylene material for use in any weather condition, with a foam-lined lid cover which creates a firm seal to keep gear dry inside the box. Each ATV cargo box includes (2) key-locking latches, rack mounting hardware, rear reflectors, and a one year manufacturer's warranty. 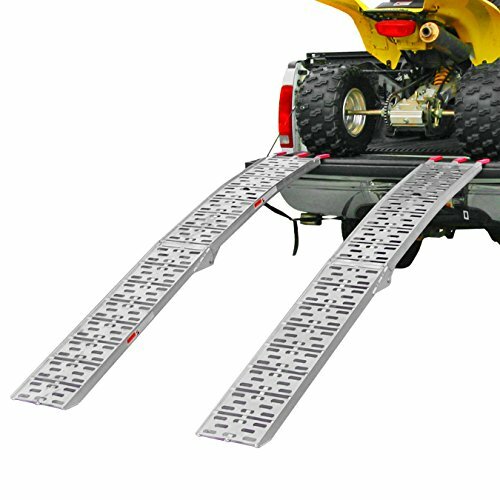 Load an ATV or larger off-road equipment including UTV's into a pickup truck or trailer with the heavy duty ATV Truck Ramp kit. 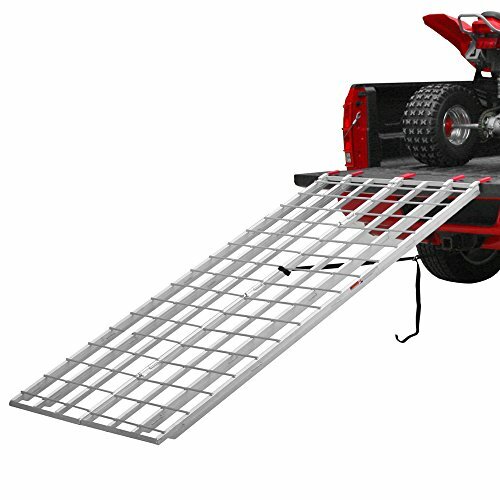 The complete loading ramp kit includes (2) 89" ATV loading ramps and (2) safety straps to prevent ramp kick-outs during loading. HD aluminum ATV ramps have a heavy duty hinge system designed to support up to 3,000 lbs. (evenly distributed weight) and are a great choice for loading and unloading off-road vehicles, ATV's, UTV's, and Golf Carts. Each ramp features a strong 0.5" solid plate style lip for tailgate/trailer attachment, tapered foot ends for smooth transitions from ground to ramps, an arched design for maximum clearance, and serrated rungs for optimal traction with off-road vehicles. 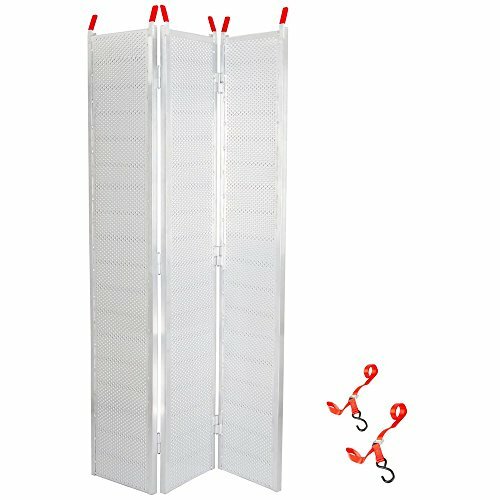 The ramp pair folds in half for storage when not in use, saving valuable room for other gear and equipment. 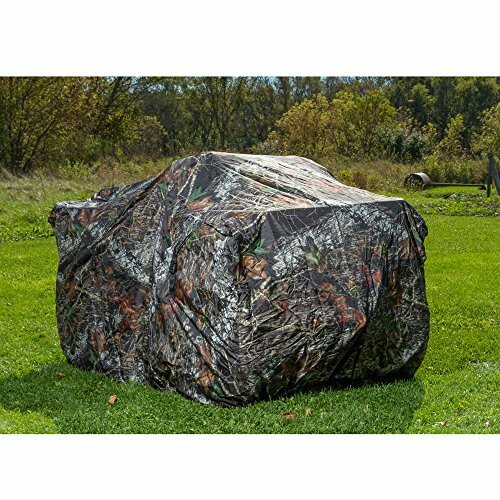 Rage Powersports Extreme Protection Mossy Oak Waterproof ATV Cover 85" x 48" x 40"
Extreme protection ATV cover for quads measuring up to 85"L x 48"W x 40"H - A great solution for trailering and storage. Each cover features waterproof 300D camouflage polyester for all weather protection and a sleek look. The cover's exterior protects an ATV from water, dirt, debris, and UV rays when the 4-Wheeler is not in use. Dual air vents reduce billowing during trailer travel and help eliminate mildew build-up during storage. Each ATV cover features zippered doors for access to the fuel tank area and rear rack while the cover is in place and includes built-in adjustable tie-down straps and a bottom elastic hem for a snug, secure fit. The quad cover also includes tension panels with snap-buckles to reduce excess slack when fitting the cover over various ATV models with different front/rear rack configurations. Rage Powersports Black Widow Aluminum Tri-Fold Extra-Wide ATV Loading Ramp - 71" x 51"
51" Extra wide ATV loading ramp system with a distributed weight capacity of 1,200 lbs. to handle off-road hunting quads, ATV's, and 4-wheelers. 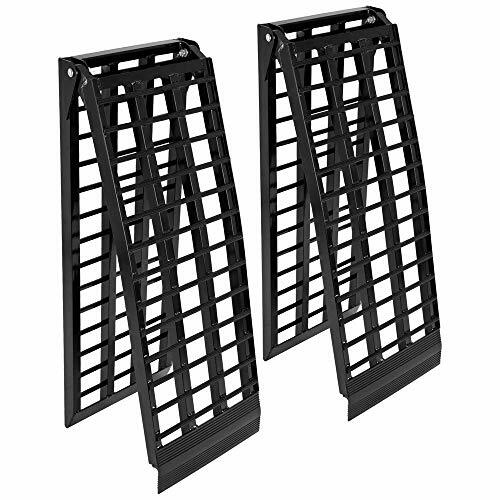 The triple-folding action ATV ramp features (2) 16" wide tracks with raised serrated rungs for maximum off-road tire traction in any weather condition. Easily load and unload ATV's into pickup truck beds or onto trailers to hauling to the next hunting area or trail. Each ATV ramp is 71" long to provide optimal clearance while loading most 4-wheelers and quads. Includes (2) safety straps and rubber-tipped fingers for securing the ramp to a tailgate or trailer deck surface. A tri-fold design enables the ramp to fold compact to 4.5"H x 16"W for storage under or beside the ATV. All-aluminum construction built strong for years of dependable use. Increase ATV cargo capacity with a rear mesh rack basket. 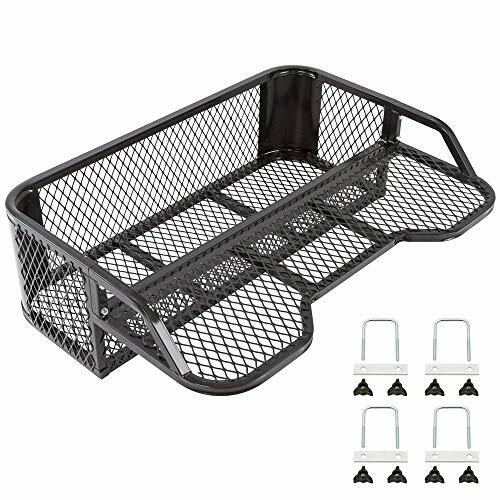 The steel ATV basket is a mesh rack designed to mount to many styles of ATV tube racks with the included hardware kit. With a drop down design, the ATVDB-4315 ATV Mesh Rack hauls up to 5.7 cubic ft. of extra gear, even 5 gallon bait buckets. Heavy duty steel mesh on a square-tube frame will hold smaller cargo items yet allow water and fine debris to pass through. Cargo nets and bungee cords are easily secured to the mesh to keep gear inside the rack. Great for hunting, fishing, trail maintenance and more! Package includes (4) ATV wheel tie-down bonnet straps. Multiple straps are required for securing an ATV, UTV, or 3 wheeler vehicle tires for trailer transport. 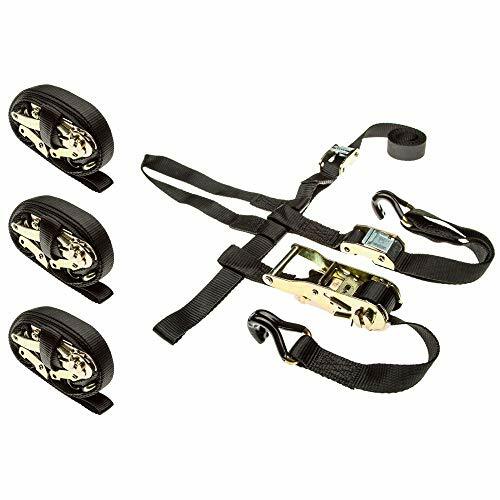 Includes (4) heavy duty ratchet straps each with (2) cam buckles for securing tight against wheel. Designed to fit most ATV and UTV tire sizes. Rubber coated hook end attachments provide added grip and anchor surface protection. Professional series Black Widow ATV lift table quickly raises a quad off the ground from 6.75" to 33.5" for service, cleaning, or storage. 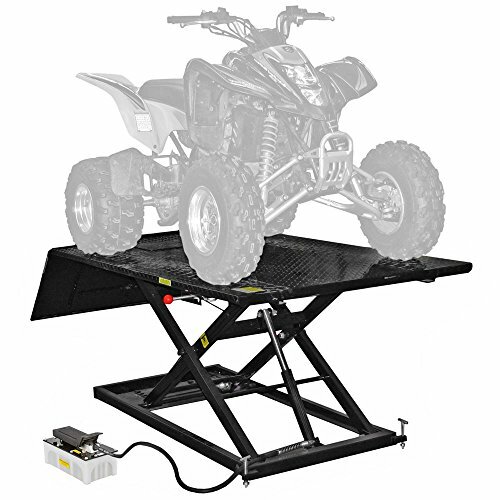 The versatile lift table features a 78" x 47" diamond plate traction platform ideal for lifting ATV's, garden tractors, and yard equipment weighing up to 1,500 lbs maximum. Includes a removable 27" x 47" loading ramp to smoothly transition an ATV from the ground to table deck, and an 18" x 20" rear drop-panel for convenient access to the front or back undercarriage area. The professional ATV lift table is operated by a foot pedal which works on compressed air with a hydraulic pump. For safety, the table platform is secured in place with a 5-position cable release style lock mechanism with 19", 28", 24-7/8", 28-3/8", and 31-3/8" lock heights. Requires 90 PSI minimum air pressure for operation. Built strong with heavy duty 11-gauge steel frame construction. Rage Powersport ATV fender and tank saddle bags are constructed from waterproof 600-denier polyester fabric with durable zipper closures. They are smartly designed and securely attach onto your ATV's gas tanks or fenders. 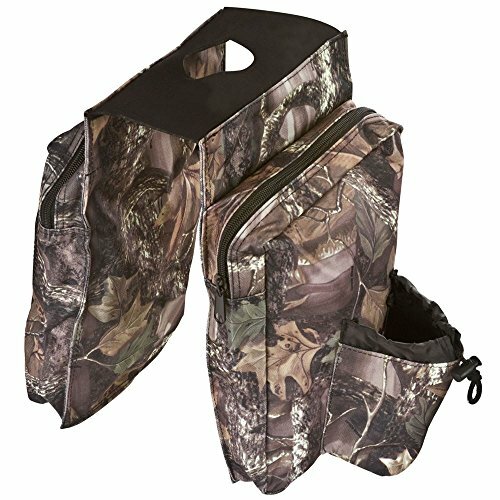 These saddle bags are available in black and camouflage colors and feature multiple mesh or lined pockets for storing extra items on your ATV. These ATV fender saddle bags have integrated securing straps, which make attaching the bags to the rear or front fender a breeze. Your tank saddle bags simply attach via the gas tank cap. Rage Powersport ATV fender and tank saddle bags are the reliable way to add storage to your rough country travels. 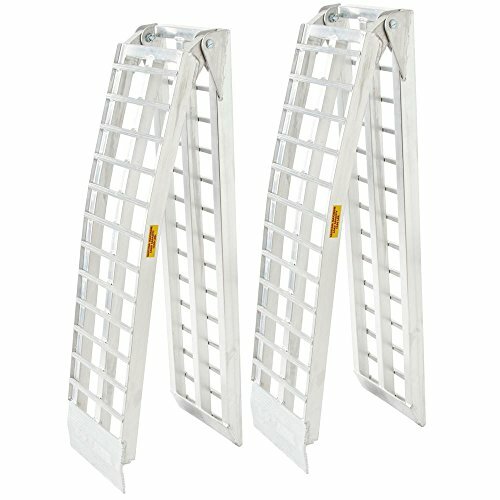 The Aluminum Folding Arched Dual Runner ATV Ramps make loading your ATV a breeze! Manufactured from high-strength, lightweight aluminum, these folding ramps are easy to maneuver and can handle loads up to 750 lbs. per ramp. The specially designed arch ensures maximum ground clearance to prevent your ATV from bottoming out while loading. 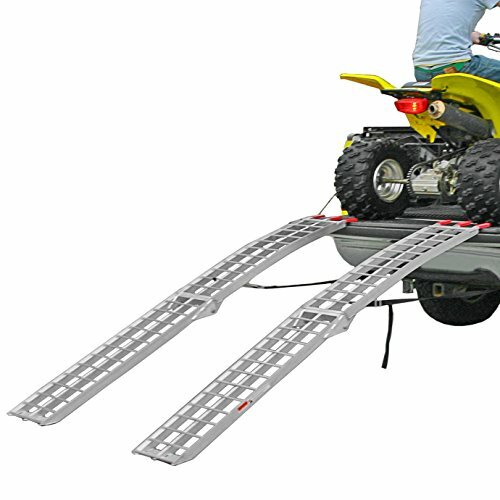 These dual ATV ramps have a unique solid plate design with a machined and elevated traction surface to ensure safe loading in all weather conditions. The included adjustable safety straps offer secure loading, and the three rubber-coated 4” mounting fingers on each ramp will prevent scratches on your truck bed or trailer. When not in use, these ramps fold in half for easy storage in your garage or vehicle. Please note, these ramps are not recommended for loading golf carts. Rear Trail Box Contoured design allows for maximum use of rack space Large storage area that fits up to 2 XL helmets with extra storage room. 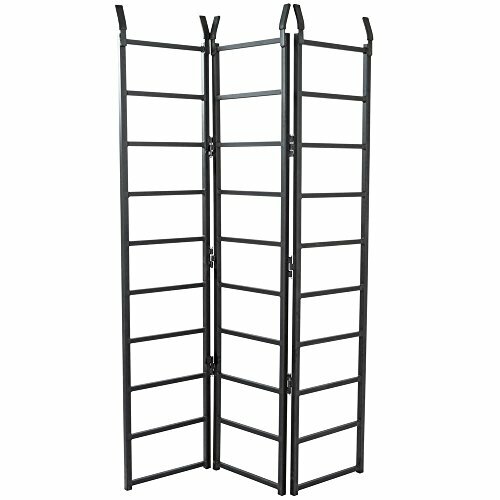 Compatible with optional accessory rack (#252268 - sold separately).